At 3.30 A.M. on August 6 1915, and officer blew a whistle and the Australians charged from their trenches into a cloud of shrapnel and a torrent of bullets. Some fell before they cleared their parapets, others within a few strides. Lone Pine was captured and reinforced, but the A.I.F. losses were extremely high. More that 2,000 Australians were killed or wounded in this single engagement, most of them in hand-to-hand fighting heavier than any other in which the Australians were to take part throughout the Great War. 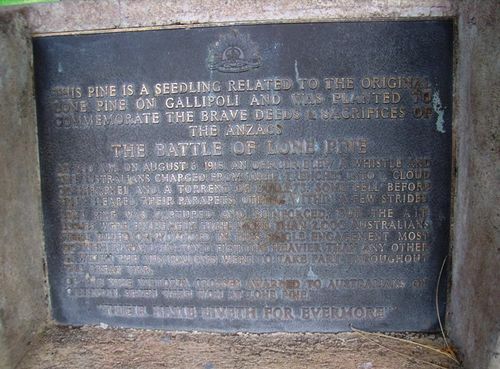 Of the nine Victorian Crosses awarded to Australians on Gallipoli, seven were won at Lone Pine.